Observers have reported a meteor over Edinburgh, after a "very fast" bright green light was seen travelling across the sky towards East Lothian. Witnesses said it happened just after 2230 BST on Monday and was as fast as a low-flying jet. The fireball lasted about five seconds before burning out. Rob Ritchie, of North Berwick, said he saw it while travelling along the A1 moving towards the Lammermuir Hills in a south easterly direction. Another eyewitness, Chris Montroy, from Edinburgh, said that looking from his window, which faces Arthur's Seat, he could see an orange streak which turned into a bright green light. Joe Prentice, of Swinton Quarter Farm, south of Duns, told the BBC Scotland news website: "I saw the meteor on Monday night, it appeared to the south, travelling from east to west, dropping at an angle of 20 to 25 degrees, and I thought it must have been falling quite close by. "Obviously I was wrong as I live in Swinton just south of Duns and 45 miles south of Edinburgh. It was quite spectacular, not unlike a firework with a nicely coloured tail." Thom Fish, from Cramond, said: "I saw this in the sky to my south east as I approached the Calder junction of the city bypass from the A71 west. "To be honest, I did think it was just a firework until I saw the news report. It was a very bright and luminous green." 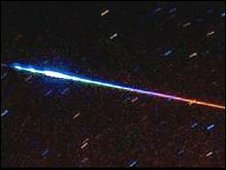 The only annual meteor shower at this time of year are the Eta Aquarids, which are associated with Comet Halley, and are usually low in the sky viewed from the UK. They reach maximum on the 5 May, but span the period between 24 April and 20 May. Were you able to capture the meteor on video footage or digital picture? If so, send it to Scotland's news website by emailing newsonlinescotland@bbc.co.uk.